The longer the time set means the capital that must be prepared is greater. This applies to all three sub-contract lookbacks. If you want to use sub-contract lookbacks, you should pay attention to the capital you have. However, please note that the benefits can be unlimited. 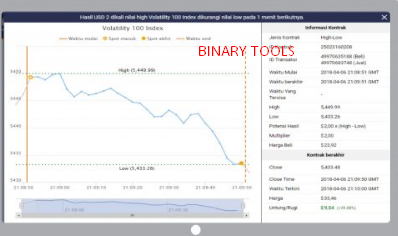 We select the 100 index volatility asset class, with a duration of 1 minute, multiplier value of US $ 2, the purchase price listed is US $ 23.92. We see the graph continues to move down quickly, then immediately take a position. We select an asset class that has a bullish signal at the moment. For example, the volatility of the 25 index, specifies the duration of 3 minutes, the multiplier value of US $ 10, the purchase price listed is US $ 29.10. Directly open position. The chart continues to rise until it gets the highest price of 3,032,647 and the lowest price at 3,028,038. The yield potential is US $ 10 x (3,032,647 - 3,028,038) = US $ 46.09. So the total profit earned is US $ 46.09 - the purchase price of US $ 29.10 = US $ 16.99 or 58.38 percent. See the picture below. In a rough sideways condition, Lookbacks High -Low you can profit too, you know. Let's practice it. In the 100 index volatility asset class, the market is in sideways condition, but has a high price jump. We can see this in the form of long candlesticks. As in the picture below. It's easy. Click the binary banner on the landing page. Follow the process of signing up completely. And if you want to consult or discuss trading problems, join the wormtraders.com forum, it's free and easy. Click the banner JOIN NOW in this article, follow the steps to complete.